Cakes & More: Cookie Fest - Round Up And The Winner! Cookie Fest - Round Up And The Winner! 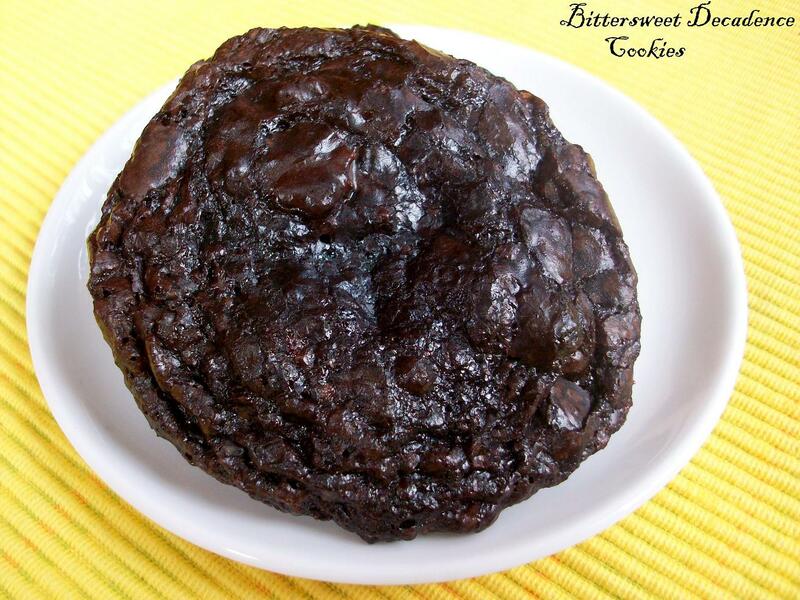 As I had promised, here is the round-up of the entries I have received for my Cookie Fest. The theme was cookies of any kind, crunchy, crispy, chewy, gooey or melt-in-the-mouth..Of course the giveaway is (as if you have not read me mention this in every other post of mine recently!) 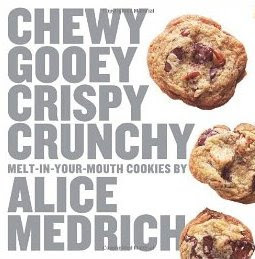 is Alice Medrich's Chewy, Gooey Crispy Crunchy Melt-in-The Mouth Cookies. A very nice book with a great deal of lovely recipes listed according to texture, lots of tips and fabulous pictures which will inspire you to bake some every now and then. One book, you must add to your collection! The entries here are mostly are in random order, but mostly in the order I have received them. Forgive me if I have messed the order! Take a look at these and bake some for yourself or scroll right down to the bottom of the post and see the winner! And no, I won't do anything funny like I did last time. God Promise! Now please don't tell me it was not-so-funny and break my heart!! 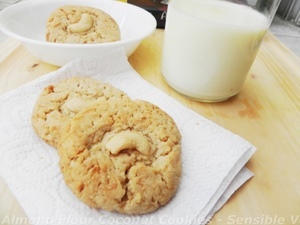 Almond Flour Coconut and Cashew Cookies from Sadhana of SensibleVeg. Gluten free and egg free with a predominant almond flavor and coconut too! Yumm!! Thanks Sadhana! 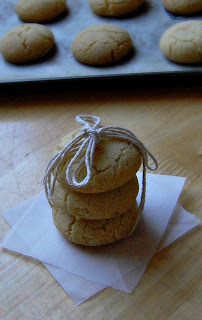 Butterscotch Cookies from Aliena of What's Cooking Today. Fudgy, gooey, buttery...Butterscotch chips in every bite! Do you have any of these chips? Put them to good use! Thank you Ally! Eggless Double Chocolate Cookies from Gayathri Ramdas Srikanth. 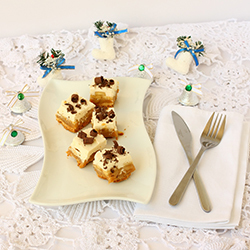 A double dose of chocolate and eggless too, enjoy these yummy treats with a glass of milk! Thanks Gayathri! 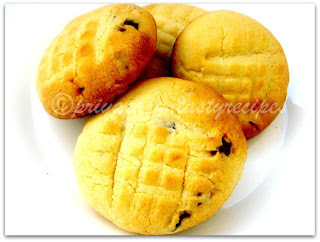 Nan Khatai from Jyothi of Pages. The well known Indian cookie! 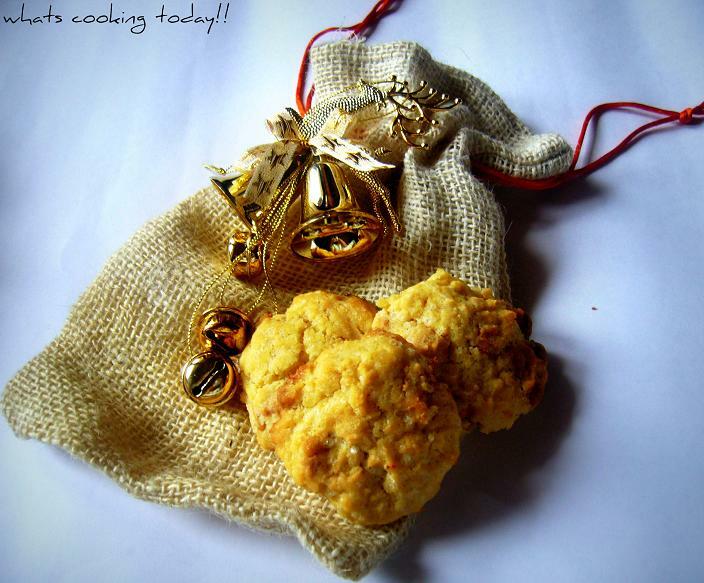 Presented like this, its impossible to resist, particularly if you like your cookies simple and buttery...Thanks Jyothi! 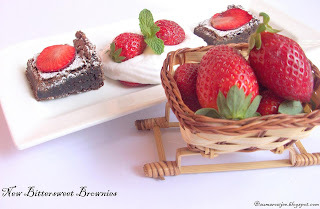 Eggless Nutella Brownies from Jyothi again! Now, isn't this very serious temptation? As if brownies are not tempting enough, she adds a huge dollop of Nutella too! Am coming right over Jyothi! Thanks so much! 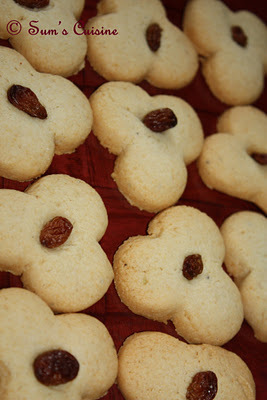 White Chocolate And Kaju Cookies from Simran of Lazy Cooks Kitchen. What do you do when you do not find macadamia nuts where you live? Use good old cashew-nuts instead and give them a completely new taste partner, white chocolate! Very interesting, not to mention delicious!Thanks Simran! Eggless Lemon Cornmeal Cookies from Priya Of Priya's Easy And Tasty Recipes. One of the most enthusiastic foodies I have seen, Priya dishes out something new everyday for her family! Kudos lady! And when you host an event, she will very surely send something your way! Here are some zesty, refreshing cornmeal cookies! 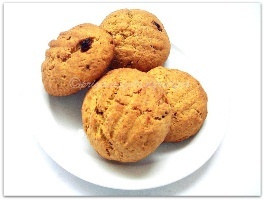 Eggless Sweet Potato And Raisin Cookies from Priya of Priya's Easy And Tasty Recipes. Cookies with a hint of sweet potato and raisins too! Isn't this innovative? 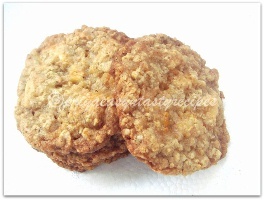 Eggless Orange,White Chocolate & Oats Cookies from Priya Of Priya's Easy And Tasty Recipes. Me, for one, just can't resist the orange and dark chocolate pairing. Now white chocolate and orange, must be lovely too! Thanks for sending all these lovely cookies for me Priya! Red Velvet Checkerboard Cookies from Priya of Culinary Chronicles. Eye catching cookies, tough to be a kid and not find these inviting! When are you hosting the next kiddo party? Here is something for you to bake! Thank you Priya! Peanut blossom cookies from Priya of Culinary Chronicles. Priya is not a fan of peanut butter, but loved these cookies! Now, I love peanut butter, so you better hide the cookie jar from me Priya! Thanks for sending these Priya! Gingerbread Men from Swapna of Swapna's Cuisine. 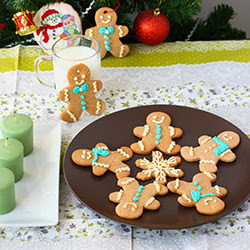 Cute little smiling gingerbread men, all dressed up in colorful icing. 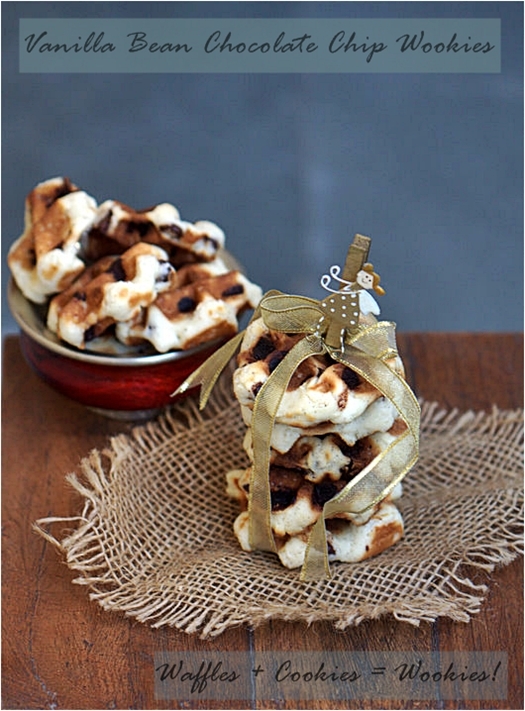 Christmas or not, these will bring a smile and a splash of festivity any time of the year! Thanks a lot Swapna! 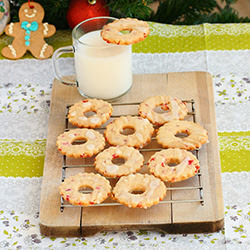 Iced Cherry Rings from Swapna of Swapna's Cuisine. Cookies with glace cherries in every bite!A holiday treat, you can't say no to! The gingerbread man there looks so happy, hey, they are all not for you, save some for me too! Banoffee Slices from Swapna again. Crispy cookie base, topped with gooey caramel ﻿and further topped with whipped cream! Cookie slices which are crisp and gooey at the same time! Garam Masala Macaroons from Deeba Rajpal. The diva of Indian baking blogs of course needs no introduction at all! I doubt if there is anything she hasn't baked and any food she has not made look anything less than absolutely stunning! Am truly, truly honored that she sent these cookies my way, thanks a zillion Deeba! Am thrilled to bits! 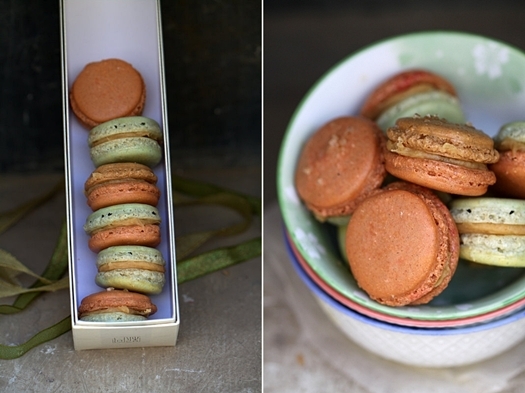 Macarons with a twist, Garam masala! Sandwiched with salted caramel butter cream! Super-inviting! Vanilla Bean Chocolate Chip Wookies. Cookies or waffles? These are wookies! These transform from sticky batter to crisp chocolate chip treats in just 2 minutes! Wondering, who emptied your cookie jar Deeba? I gobbled them up of course!! Lemony Shortbread Cookies from Sanjeeta of Lite Bites!. 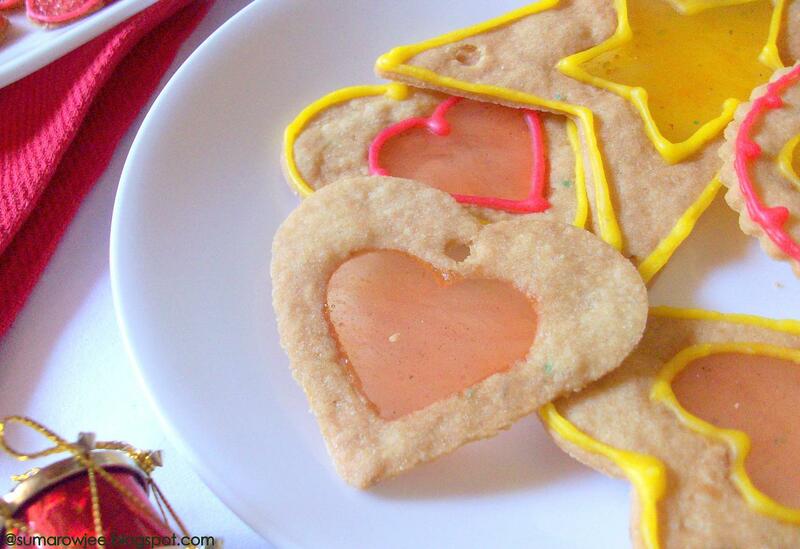 She made a hundred of these buttery, zesty treats for her hubby's co-workers! With pistachio meal and the zing from lemon zest, these got to be a real treat! Thanks Sanjeeta! Nankhatais from Sumana of Sum's Cuisine! Buttery and delightful cookies, she has managed to bake these not withstanding her super hectic schedule, just for my event! Am so very glad and touched that you baked these for me Sumana, thank you so much! Macadamia And White Chocolate Chip Cookies from Champa of Versatile Vegetarian Kitchen. Truly a very versatile foodie, extremely talented baker, the lady who taught me to love yeast! White chocolate and macadamia nuts in a cookie, make it a real treat! Quick Palmiers from Champa again! Flaky, sugar kissed palmiers from scratch, made quick and easy with a flaky quick base almost similar to pie crust she says, but with the addition of sour cream. Surely got to try this! Hundereds and Thousands from Veena of Kitchen Celebrations. As you know, she is a food blogger as well, but due to some technical issues, unable to access her blog. Thanks so much for sending these colorful cookies for us Veena, and hope your blog will be up and running even before you know! Apricot Nut Slice - Apricot jam ,nuts, coconut and cocoa topped on a par-baked cookie base and baked further. Delicious! Thanks Veena! 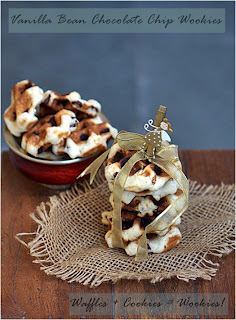 Snowballs - Cookies masquerading as snowballs! These come together in a flash, baked and then rolled in icing sugar. Wouldn't this be nice on your Christmas table? Bittersweet Decadence Cookies - A whole lot of chocolate with just a little flour to hold it together, and very little butter! These make very very chocolaty cookies which are more dangerous because you can freeze the dough and have these in a matter of minutes! 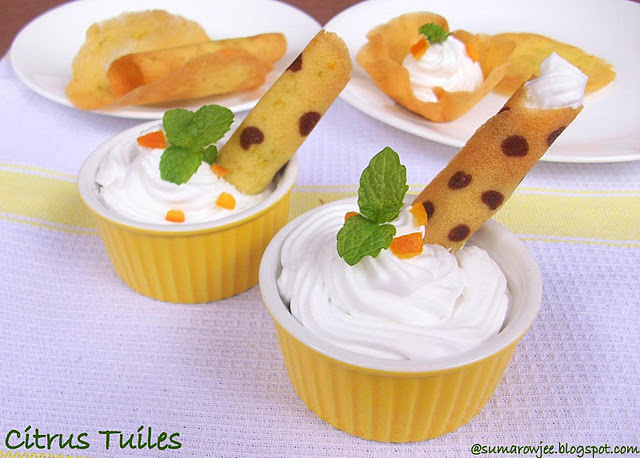 Citrus Tuiles - Super thin, crisp and elegant cookies, you could decorate and shape as you wish. Little baskets, cigars, twisted strips...fill them with whipped cream or serve with ice cream! Will you believe, these are darn easy and quick to make? Stained Glass Window Cookies - Whole wheat and eggless, these cookies have a 'window' filled with crushed candy, which melts and hardens as you bake. This makes for ornamental cookies with translucent centers. Perfect to hang on your Christmas tree ! New Bittersweet Brownies - Brownies with a deep chocolaty taste, a texture somewhere between cake and mousse. Do you love your chocolate? You got to try these! Congratulations Gayathri! Please email me your mailing address and your copy of the book will be very very soon on its way!! That's a whole lot of cookies!! lovely roundup Suma ! bookmarking page too :) congrats to Gayathri .. Excellent roundup Suma, many cookies to try and taste,thanks for ur kind words and soo happy to read wat you wrote about me,blessed to get friends like u..
Nice roundup, Suma! Congratulations to Gayathri! love the way you written this post Suma. very unique very you. Lovely Round up! Congrats Gayathri! Wow is all I can say looking at these cookies. Great job. Thank u sooo much Suma...Winning giveaways always seemed like winning a lottery to me !! am so excited and will be posting recipes from it as soon as I get my hands on the book..
Friends, Thank u all so much for your wonderful wishes..
nice round up...was thrilled about your kind words..congrats to gayathri..looking forward to many more events from you. Nice round up. I am excited to try many of the recipes. I like that there are many eggless recipes. Great job by the entries on their photographs which are very beautiful. Mock Puff Pastry - Easy And Quick!